The International Baccalaureate Middle Years Programme (MYP), designed for students aged 11-16 provides students with a framework of learning that encourages students to become creative, critical and reflective thinkers. The Programme encourages students to make meaningful connections between their learning and the real world. The MYP is academically rigorous. It challenges the students academically and develops their ability to ‘think outside of the box’, preparing them for the Diploma Programme and ultimately university placement. IB students and teachers from schools all over the world explain the MYP in this great film. Not only does the MYP foster the development of skills for communication, intercultural understanding and global engagement, it also provides students with opportunities to develop the knowledge, attitudes and skills they need in order to manage complexity and take responsible action for the future. All of this is developed through the MYP global contexts. The global contexts are implemented with the aim to develop international-mindedness and integration. All units are developed with the global contexts to create learning communities where students can increase their understanding of language and culture, which will help them to become more globally engaged. The focus of Approaches to Learning is on helping students to develop the self-knowledge and skills they need to enjoy a lifetime of learning. At ISUtrecht we teach our students practical and self-knowledge skills, which will help them with the challenges posed by the IB MYP as well as the Diploma Programme and higher education. Language and Literature. The school offers English and Dutch. Additionally, in compliance with the IB philosophy, the school encourages students to keep up their mother tongue (home language). Language Acquisition. Also known as a modern foreign language. The school offers Dutch, Spanish for grades 6, 7, 8, 9 and 10 and English for grades 6, 7 and 8 only, however the school provides additional support for students in grade 9 and 10. Individuals and Societies. 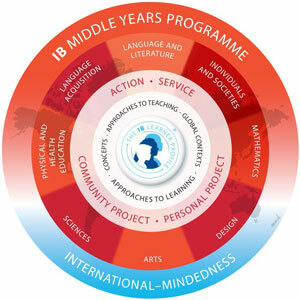 This is an integrated programme for all five years of the MYP. Students will study topics in economics, business, psychology, geography, history, and sociology. In grade 10, students will have the option to take an additional business course, in preparation for the Diploma Programme. Sciences. In grades 6, 7, 8 and 9 students take an integrated science course, covering topics such as ecology, earth science, space, physics, biology, and chemistry. In grade 10 students study biology and chemistry with the option of physics, in preparation for the Diploma Programme. Mathematics. In grades 6, 7 and 8 the levels are integrated and students are extended accordingly. In grades 9 and 10, standard and extended levels are taught as separate courses. Arts. The school offers music, visual arts and drama over the course of five years of the MYP. Physical and Health Education. This is an integrated programme for all five years of the MYP. There are indoor and outdoor sports facilities and a theory course is provided. Design. This is an integrated programme for all five years of the MYP. Design is a combination of ICT and design technology.